There was a charity stall, under the County Hall, raising money for Helen and Douglas House - the local hospice for young people. Harry is just showing that he supports this good cause, especially after the ladies running the stall made such a fuss of him. He got very waggy tailed and excited going first to one then the other. If you hurry, you may still catch them, and they might even make a fuss of you too - that last bit is addressed to dogs. Harry always makes me smile. Keep up the good work Harry. Are you going to appear in the Oxford Mail again? 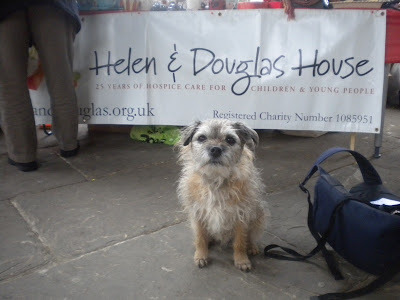 I am glad Harry lends his support to Helen and Douglas house. They used to have their own waggly tailed person, on black lab called Caesar. He used to pay us visits when we stayed.